Miss Mindy in Wonderland! Daydreaming away about a world of her own, the curious Alice unexpectedly finds herself in the mad, wondrous world of Wonderland in Walt Disney's Alice in Wonderland. The imaginative heroine bravely adventures through the strange, enchanting realm, meeting the eccentric residents of Wonderland along the way. When she stumbles along a mad tea party, the Mad Hatter and March Hare introduce her to their zany tradition of celebrating unbirthdays! Reimagined in Miss Mindy's whimsical artistry, Alice's signature style is subtly updated with light pink details on her newly pinstriped petticoat and scalloped hem of her pinafore apron. Within her apron pocket, the lazy Dormouse contentedly snoozes away, exhausted from entertaining guests with his song. The black bow she is known to wear in her hair is exaggerated to emphasize her bright, blonde shoulder-length locks. The large bow decorating the back of her apron also acts as a tripod to keep her upright and ready to display. In her hand, she holds a cup of freshly brewed tea to toast to your very merry unbirthday. 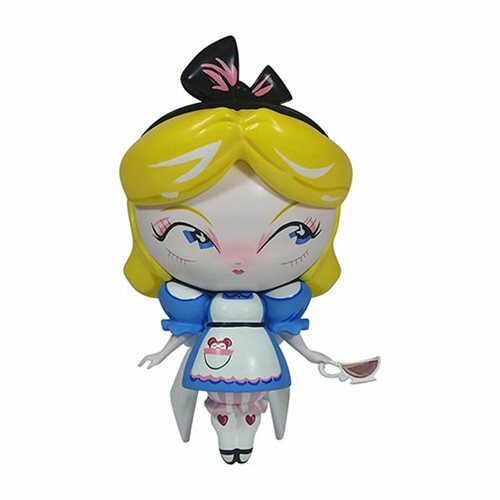 Fall down the rabbit hole and join Alice for a mad tea party with this lovely Disney The World of Miss Mindy Alice in Wonderland Alice Vinyl Figure! Measures about 7 1/10-inches tall x 5 2/5-inches long x 3 1/4-inches wide.